Backup E-mail 1.0 is backup & restore software developed by WCCL. Backup E-mail uses an easy wizard interface to backup everything from Microsoft Outlook, Outlook Express, Eudora Pro & Light, Netscape Messenger, Netscape Mail, Opera, IncrediMail, Pegasus Mail, TheBat, and PocoMail. Just click and you're done! Backup E-mail takes your e-mail messages, address book, settings, mail and news accounts, message rules, blocked senders lists and signatures - and stores them all in one single file. system utilities software is demo, which means you can download and use this limited edition of Backup E-mail 1.0 for free. 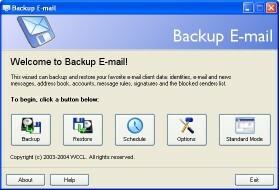 To use full version of Backup E-mail 1.0 you have to buy the backup & restore product for $24.95. Backup E-mail 1.0 is available at regnow and WCCL website. Backup E-mail 1.0 supports different languages (including English, Russian, French). It works with Windows 98/XP/Vista. We have tested Backup E-mail 1.0 for spyware and adware modules. The software is absolutely safe to install. We has completely tested backup & restore software Backup E-mail 1.0 many times, written and published the interesting article and uploaded installation file (1200K) to our fast server. Downloading Backup E-mail 1.0 will take minute if you use fast ADSL connection.